Around 20,000 years ago, the western margin of the Green Bay Lobe advanced onto the eastern part of the Baraboo Hills. There it dammed the upper Wisconsin River, forming glacial Lake Wisconsin. The broad, flat sand plain of central Wisconsin was once the floor of this large glacial lake. 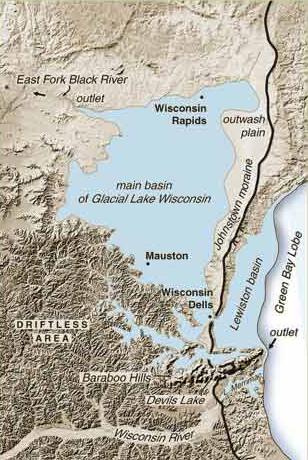 At its largest, glacial Lake Wisconsin was about the size of the present-day Great Salt Lake in Utah. As the Green Bay Lobe began to recede, approximately 18,000 years ago, the ice dam failed and the lake drained, probably very rapidly, around the east end of the Baraboo Hills and down the lower Wisconsin River. This release of water sliced through the sandstone bedrock, forming the Wisconsin Dells and the broad steep valley of the lower Wisconsin River. The floodwaters also swept huge boulders and icebergs many miles downstream. It’s difficult to imagine what the torrents of water that gushed out when glacial Lake Wisconsin drained could have looked like. To get the barest hint of it, take a look at the erosion caused by Lake Delton when it emptied in 2008. By comparison, glacial Lake Wisconsin was roughly 4,000 times larger. 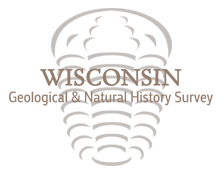 Today, the Central Sand Plains are home to forested areas and wetlands as well as the irrigated agricultural land on which most of the state’s potatoes, cranberries, and vegetables are grown.